Alas, Calvin was not able to repeat his feat in the final which took place four hours later and finished joint-fourth with Salfa Omar of the United Arab Emriates in 10.60sec. His new record today makes him Singapore’s fastest man this season and a certainty for the SAAA’s nomination for the wildcard entry into the 100m at the Beijing Olympics. Meanwhile, jumper Matthew Goh didn’t have a great day at the office as he finished ninth in the long jump at the championships. The 17-yearld, who holds the natinal junior mark of 7.23m, could only manage 7.06m this time and finished ninth. National triple jump record-holder Stefan Tseng will be in action tomorrow. My sources in the media tell me that rising young talent Calvin Kang has qualified for the 100m semi-finals of the 13th Asian Junior Athletics Championships in Jakarta after clocking 10.69sec in his heat today. I’ve tried checking the competition’s website ( www.asianathletics.org ) for more information but nothing has been updated so far. But if so, it means that Calvin is back to clocking sub 10.6sec-timings after winning this year’s 2nd All-Comers meet in 10.77sec and the South-east Asian Junior Championships 100m crown in 10.70sec. The 17-year-old Auckland University of Technology student currently holds the national junior record for the century sprint after clocking 10.55secs at the Sri Lanka Open last November. The semi-finals and final of the 10m are scheduled for Friday afternoon (13 June ). I’ve no news on whether long jumper Matthew Goh has qualified for Friday’s long jump final. But the fact that the qualifying distances for the long jump final at the 2006 Championships ranged from 6.10m to 7.37m means that Matthew should qualify comfortably. He is, after all, the national junior record holder at 7.23m. 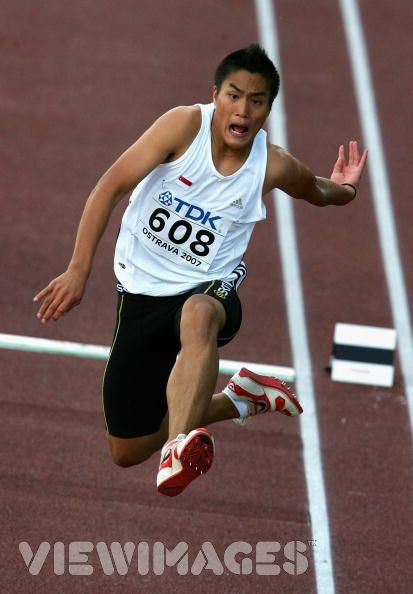 (By the way, Kennth Wang Kan finished eighth in 206 with 6.92m). Here’s wishing Calvin and Matthew all the best for Friday. 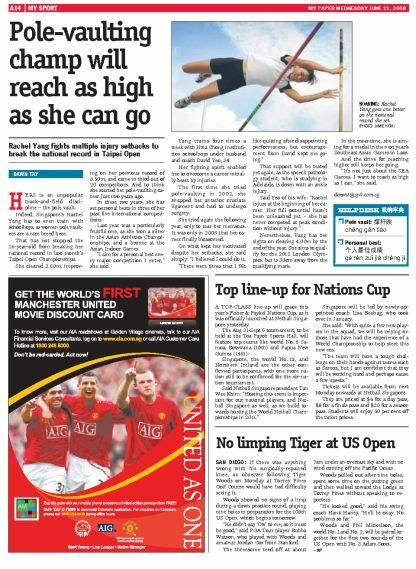 mypaper (mypaper.sg) reported today that national pole vaulter Rachel Yang soared to a new national record at the Taipei Open last month. The 26-year-old cleared 3.60m to break her own national mark of 3.50m. She also finished third in her event. Rachel is now aiming to clear 4.00m by the end of the year. I was really pleasantly surprised when I stumbled upon this story today. Even though Rachel’s achievement is a month old, it was still news to me because I don’t recall having read it in any of the main English papers. I guess also that mypaper chosed a more featurish approach to announcing Rachel’s new national mark because the news was no longer fresh (even though it hadn’t been reported previously ). No matter, I enjoyed reading it all the same because it gave me a better insight about the athlete. So my heartiest congratulations, Rachel! And may you continue to break your national record many times over. The 26-year-old is probably still some distance away from being a possible medal contender at next year’s SEA Games in Laos – after all, the qualifying height for the 207 Games was 4.60m. But as the saying goes, all good things come to those who perservere. And judging from the story on Rachel, she does come across as a fighter. Back to the lack of media coverage on Rachel’s feat – I wonder why this could have happened in the first place? It can’t be that the media isn’t interested judging from the sort of increasing coverage that they have been giving to local athletes. Was there no press release by the Singapore Amateur Athletics Association? Or does the SAA usually not do such things? And if so, why not? Shouldn’t this be part and parcel – the bread and butter, in fact – of a national sports association’s scope of work: to find as many opportunities as possible to highlight the achievements of their athletes? Wouldn’t this be one of the most fundamental things that one, as the governor of the sport in your country, would want to do – draw public attention to all the good things that are happening in their sport? In the light of this, this is my call to action to everyone out there who visits this site: if you do know of any achievements by our national athletes (from seniors to juniors to school athletes) that have gone unnoticed bythe media, please let me know, either by dropping a comment at this site or by sending an email to sporesportsfan@yahoo.com.sg. Going back to Rachel’s new national mark – do you know that this means that four new national open records and three national junior records have been set this year? Triple jumpers Stefan Tseng and Mariam Shazana set new national men’s and women’s open and junior records at the Pahang Open last month (Stefan cleared 15.71m while Mariam jumped 11.66m) while Kenneth Wang Kan set a new national men’s long jump record (7.41m ) at the 3rd All-Comers Meet. Finally, Matthew Goh set a new national junior mark in the long jump earlier this year with his 7.23m effort. And the exciting thing is that there could be more to come this week. You can probably forget about them setting any Asian junior records because the current marks are way beynd what they can possibly achieve right now. For example, the boy’s triple jump mark is 16.73m, the long jump mark is 7.85m and the 100m record is 10.26sec. (Mariam isn’t competing because she hasn’t met the qualifying mark of 11.77m ). But who knows what the higher level of competition may bring out of them? If the conditions are right, and the athletes are in the zone, we could see a few more natinal marks added to this year’s tally. And if that happens, you can be sure that I will not only be writing about it here – but also passing the information to the local media. Here’s wishing the Singapore team in Jakarta all the best.